This is an extremely easy soup recipe to wipe up and is enjoyed by the whole family! Soup is an important dish of every meal. Just like salad, having a bowl of soup has a lot of health benefits as you get to eat more veggies packed with nutrients. Eating nothing but soup for a meal can also make one slimmer but it can be a difficult challenge. So, we usually team up the simple soup with some chicken or prawns or just some meat slices to go with it…hence making it a complete meal without the guilt factor ! Eating more soup makes you more energized and feel full for hours. In a deep vessel, boil the chicken pieces till they are tender. Add a pinch of salt and pepper to this water while it is boiling since this gives flavor to the chicken. Next, add the carrots and the chicken stock. Bring to a boil. Let the soup boil till the carrots have softened. While the soup is simmering, Season the Chicken Breast piece with salt, pepper and Harissa paste. (I have used Harissa Paste to give a spicy punch to the chicken, you can season the chicken with any paste of your choice) Fry the chicken in a non-stick griller pan with a little bit of olive oil. Slice the chicken and keep aside. Next is to soft boil the egg. The trick is to first let the water boil, then gently immerse the egg into the water and let it boil for 4 minutes. This ensures that the egg is soft and gooey and oh…so yummy from the centre with a firmly set egg white. Peel the egg and carefully slice it into half just prior to serving the soup. 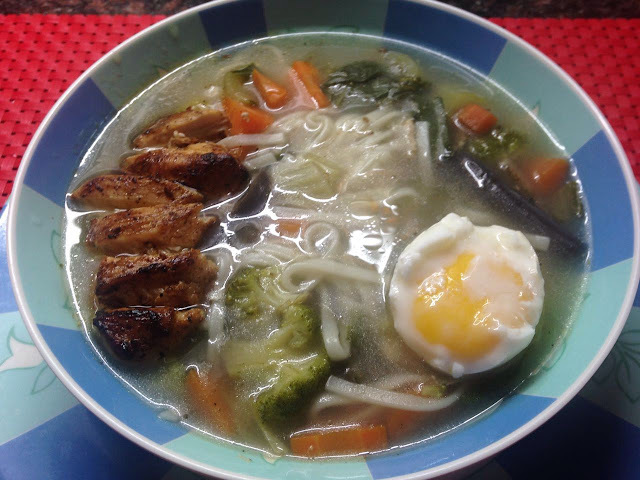 Plate the chicken soup in a deep bowl with the grilled chicken pieces and the soft boiled egg. The ultimate comfort food for the whole family to enjoy !